Soil feedbacks are a big uncertainty in climate change | Watts Up With That? Soil C stocks are the net result of outputs and inputs of plant C, but most warming research focuses only on outputs, making stock responses highly uncertain. Warming-induced outputs (red arrows) in the schematic are represented as CO2 fluxes, reflecting the assumption in ESMs that the land-C–climate feedback occurs through warming stimulating the activities of soil microorganisms that decompose plant material. There is more than twice as much carbon in the planet’s soils than there is in its atmosphere, so the loss of even a small proportion of that could have a profound feedback effect on the global climate. Yet in its most recent report, in 2013, the Intergovernmental Panel on Climate Change (IPCC) used models that paid less attention to soil carbon potentially entering the atmosphere than had earlier reports, concluding that there simply wasn’t enough evidence about how warmer global temperatures might impact soil carbon stocks. A new Yale-led paper makes the case that developing meaningful climate projections will rely on understanding the role of “soil carbon turnover” and how it might potentially trigger climate feedbacks in a warming world. Writing in the journal Nature Climate Change, a team of scientists calls for more collaboration between modelers and soil scientists to improve the scientific understanding of the mechanisms that control the creation, stabilization, and decomposition of carbon in the soil. That in turn will promote the kinds of experiments that will begin to remove uncertainties about the competing mechanisms that drive soil carbon stocks, the researchers write. While scientists might never eliminate all uncertainty when it comes to evaluating the mechanisms driving changes in soil carbon stocks, new research advances are making it possible to predict the full range of potential outcomes, said Mark Bradford, an Associate Professor of Terrestrial Ecosystem Ecology at the Yale School of Forestry & Environmental Studies (F&ES) and lead author of the study. And that, he says, will increase confidence. Warming temperatures can trigger two very different changes in soil carbon soil levels. On the one hand, they can stimulate the growth of plants, increasing the amount of carbon storage potential. Conversely, those higher temperatures can also accelerate the activity of organisms that live in the soil and consume decaying plant matter. In that case, there is a net increase in the amount of carbon released from the biosphere into the atmosphere. In other words, one function puts carbon into the soil, keeping it out of the atmosphere, while the other emits it into the atmosphere. The twist, however, is that the processes that emit carbon from the soil also convert a small fraction of the decaying plant matter into stores of carbon that can be locked away over millennial timescales, which would be optimal to minimizing climate impacts. While scientists have made great advances in understanding how plants will respond, their ability to evaluate how much carbon goes into the soil, and where it ends up, is made difficult because it’s not possible to measure directly. For these reasons, he said, much of the understanding of how soil carbon stocks will respond to warming is based only on the outputs, which is like trying to calculate the balance of a bank account based simply on how much money is being withdrawn. Another complicating factor is that our knowledge of how soil carbon is created and stabilized is undergoing somewhat of a conceptual revolution, and only one set of ideas is represented in the climate models, the new paper says. For decades scientists assumed that carbon entering the soil through materials that are harder to “digest” by microbes — like, say, wood — would be more likely to remain in the soil longer. This is important because it’s the easily digestible plant matter — such as the sugars released from plant roots into the soil — that likely eventually get converted into the long term stores of soil carbon but they are also the hardest inputs to quantify. This growing awareness shifts the way scientists view ecosystem management, from thinking about the biomass that you can see aboveground to a focus on thinking about the amount of carbon that can be pumped belowground directly through the roots of the plants and to the organisms in the soils. Ultimately, Bradford says, it will be impossible to eliminate all uncertainty. But that, he says, is not such a bad thing. Planetary warming may be exacerbated if it accelerates loss of soil carbon to the atmosphere. This carbon-cycle–climate feedback is included in climate projections. Yet, despite ancillary data supporting a positive feedback, there is limited evidence for soil carbon loss under warming. The low confidence engendered in feedback projections is reduced further by the common representation in models of an outdated knowledge of soil carbon turnover. ‘Model-knowledge integration’ — representing in models an advanced understanding of soil carbon stabilization — is the first step to build confidence. This will inform experiments that further increase confidence by resolving competing mechanisms that most influence projected soil-carbon stocks. Improving feedback projections is an imperative for establishing greenhouse gas emission targets that limit climate change. The science is less settled every day. This kind of content is why I come here. Very interesting and all about the science. Notice how having lost the argument on the fundamentals the warmist crowd is moving more and more to peripheral conjecture. Okay, so Stonehenge was built by dinosaurs. Excellent! I think that is the most convincing explanation for Stonehenge that I have seen. The only factor missing is which dinosaur actually cut and shaped the rocks. For that job I nominate Pteranodon, or perhaps Brachiosaurus. Tyrannosaurus rex was too busy. And his arms were too short. Ankylosaurus. They used their tails as mallets to chip away the stone into the block shapes. All under the direction of the Troodons, you know. Nah. How Stonehenge was built is settled science. 97% of Stonehengeologists agree that Merlin the magician played his magic flute and the music caused the rocks that compose Stonehenge to float through the air and settle into place. And if you don’t believe it was Merlin who built Stonehenge then you just don’t believe in Science. Talking about elemental carbon rather than the actual carbon compounds sounds like propaganda rather than science. It is accounting. Nobody is talking about elemental carbon. It makes you wonder if they have a the first clue on the subject, especially after reading that abstract. Someone that has actually studied soil science and was interested in researching this might do something like actually go out into the real world and measure total organic carbon from soil cores and determine organic carbon storage vs temperature via some other proxy in the same region, such as lake deposits. And then do it over and over and over again making a career out of it and contributing to the science. They don’t even try to hide the fact that it’s not even science anymore. FWIW I had access to and used a carbon monitor, that could be placed over soils in a secured cover. the cyclic variance in soil over the course of 24hrs alone was staggering. and the moisture content then adds another huge curveball into it. Soils are currently absorbing something between 10% to 20% of our emissions each year (ie. soils are a net absorber of around 1 billion tons Carbon per year, we can’t really measure what is happening in total but each individual study finds that Carbon is being stored in soils at fairly high rates – 1 billion tons is a very conservative estimate). But here, they are musing like soils are a net source and/or have a positive CO2 feedback. You actually do not need to know any facts at all to be a climate scientist. I have read about Holistic land management – basically, moving livestock across an area rather than letting them graze in a mainly stationary mode – and the de-desertification this can produce. From what they indicated, increased de-desertification could fix more carbon than the max predicted by global warming. The idea of making hypothetical ‘undue levels of warming’ moot by increasing grasslands and decreasing desert is very attractive to me. Grassland is a very efficient Carbon sink. If semi-undisturbed and/or Zero-tilled etc, each acre of grassland/pasture/meadow/wild prairie sinks about 0.3 tons Carbon per year. Grassland soils are probably 0.5 billion tons Carbon by themselves, let alone other forest soils etc. A picture tells a thousand words. That’s one hell of a generalization, Bill and is the sort of nonsense that politicians seize on when they hoodwink the general public into accepting that a Government is doing a great job ‘curbing emissions’ by investing in Carbon Sequestration. 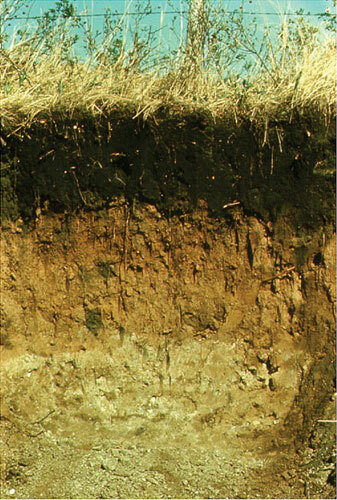 You will find a range of soil profiles under grasslands, and the amounts of organic matter therein will be governed by climate, parent material, microbial mass and composition, etc etc. I hope the climate modellers don’t jump onto your figures and adsorb them into their computer games. so the loss of even a small proportion of that could have a profound feedback effect on the global climate. Doesn’t more CO2 mean more plant Growth? Doesn’t more plant Growth mean capture of more CO2? Doesn’t capture of more CO2 mean less available CO2? How many cubic miles of just “Peat” and equivalent captured CO2 is there on the earth that hve been there for thousands of years? Doesn’t that mean there will be a natural balancing point? What is that balance point? Which also begs the question, “Why are we converting naturally captured CO2 in plant life into free CO2 molecules by burning and converting into fuel? “converting naturally captured CO2 in plant life” was meant to imply all of the various forms of converting plants (not coal, oil) into “biofuel/” and the burning of wood in many countries, including the USA. Even dumping those “useless” wood chips or sawdust into a organic mulch process means that the carbon is “captured” for several generations. If those useless wood chips are burnt the carbon, and other byproducts are put in the atmosphere. To keep food on the table? To keep from freezing to death in winter? To avoid having to feed horses as draft animals and also avoid their vast volumes of excrement? On second thought, feed for horses was biofuel. and it required vast amounts of land. “If you want fresh, clean oats – you must pay a fair price. Having horses, I consider their droppings to be processed grass/hay. For a little humour – what is the difference between a politician and a country boy? The country boy has the Bull Shht on the outside of his boots. Seems to me that the water absorption/percolation and vapor release from soils would be a much bigger factor in climate forcing than CO2. ..Every day, there is more and more evidence of the rats escaping the sinking liberal ship..Hillary has not been kind to Warmanista’s delusional cause….The “Silent Majority” has awoken…. I wish you were right, but unfortunately I am not so optimistic. Probably due to the situation here in Ontario Canada getting worse every day…. So if the Sahara greens, will anyone notice beyond the level of the satellites? Funny how there are so many undefined and unexplained issues for a settled science. I would imagine more rain results in more decay which results in more CO2. Yet we know all the added CO2 is due to man, not decay…right? Before this can be considered remotely credible, the authors need to prove that CO2 causes warming. CO2 by itself is incapable of causing significant warming–models have to interject a water vapor factor to get the warming they propose. Everything in their models depends on small increases in CO2 causing increase in water vapor, yet records back to 1947 show no increase in water vapor. clearly the records must be wrong. giss will no doubt debunk the facts soon enough and ensure they are aligned with their models, using only peer-reviewed, 97% certified adjusto-gate. question: how can the science be settled if only 97% agree? I would expect 100% to agree if the science was truly settled. Wow! We were told at the start that the “Science was settled”! As each day goes by, it looks more and more as if the Science was not really even touched, let alone ‘settled’. Every day some new aspect comes up and there are no answers available yet. NO. NO. NO. BAD. BAD. BAD. Take the blinders OFF people! Here’s a thought…throw out your model and use raw data. Do you OWN a microscope?! Meiofauna aren’t that hard to see buddy. Another admission that when one examines the previous models of CO2 balance, they are inadequate. One resounding DUHH! There is 50 times as much in the oceans which the recent OCO2 satellite analysis indicates might be of greater importance. Or possibly OUTSIDE that range – an interesting admission. “Ultimately, Bradford says, it will be impossible to eliminate all uncertainty. But that, he says, is not such a bad thing. (otherwise my funding would disappear). Sorry – that last comment seems to have been omitted. Of course, broaden the error bars and it must. What happened to “the science is settled”? If you broaden the output curve because you become more uncertain you will be more likely to be on target? Duh, of course. Make it flat and you won’t be wrong! What is “settled” is that not enough taxpayer money goes to whatever discipline is opining. That is both natural, in that everybody thinks what they are doing is REALLY important, and corrupt, as people are greedy and envious of those doing better than they are. These authors are not actually wrong as all serious searching for facts and truth has value. Taxpayers just need elected officials to catch on that the taxpayers need their own money at least as much as highly paid denizens of Academia. That is both natural, in that everybody thinks what they are doing is REALLY important, and corrupt, as people are greedy and envious of those doing better than they are. No, I am afraid the real explanation is even more sordid than that. People desperately need to get funding for the only thing they know how to do, no matter how irrelevant. Maybe not as well publicized but perhaps on as strong “mass balance” grounds is that of the half of anthropogenic CO2 absorbed in sinks, half of that is going into an inorganic sink whereas the other half is going into an organic, living, photosynthetic sink. This is established by recent, accurate assays of atmospheric oxygen. Fossil fuel combustion uses up oxygen, and when the resulting CO2 goes into the inorganic “dissolved CO2” ocean sink, you don’t get the oxygen back whereas when plants absorb the CO2, you indeed do get the oxygen back. With respect to the half-of-the-half of human-caused CO2 emissions absorbed by plants, the terrestrial biosphere is a homeostatic system where plant growth results in net CO2 uptake between plant photosynthesis by day with plant respiration at night. Dead plant material that has come into being by absorbing CO2 is in turn incorporated into soils, and the subject of the linked article is that soils in turn return CO2 to the atmosphere through the respiration of bacteria and fungi feeding on the organic component of the soil. Using the Roger Revelle’s modification to Henry’s law to get the 10’th rate law for the absorption of atmospheric CO2 into the “inorganic carbonate (chemical) system” of ocean water, using a 2-compartment ocean model with surface and deep ocean reservoir, and using a constant rate of decay of organic soil matter, it is possible to choose the rate plant decay in soil along with an atmospheric CO2 concentration-dependent plant uptake coefficient to have the atmosphere in equilibrium in the mid 19th century and to closely match the Keeling curve for atmospheric CO2 recently reaching 400 ppm. This quasi steady-state carbon model, however, does not account for the observed large year-to-year fluctuations in “net CO2 emissions” as reflected in increase in the atmospheric CO2 concentration. 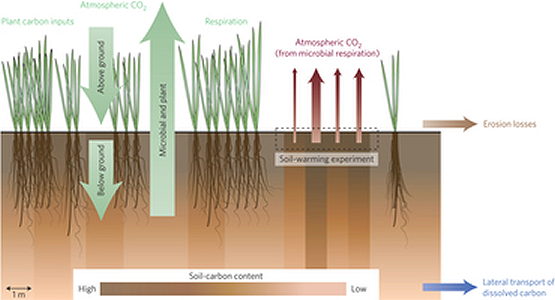 Making the emission of CO2 from soils increase with temperature in the amount measured by Bond-Lamberty and Thomson, Nature 464 pp 579-582 http://www.nature.com/nature/journal/v464/n7288/full/nature08930.html, and increasing the sensitivity of plant CO2 uptake with atmospheric concentration, it is possible to match the year-to-year fluctuation in net CO2 emissions, match the Keeling curve, and get an improved match to both the non-radioactive C13 and atomic-test C14 atmospheric concentration curves. The consequence of accounting for the temperature dependence of soil CO2 emission is that as much as half of the net increase in atmospheric CO2 from about 290 ppm at the start of the 20th century to 400 ppm today is the result of increased soil emissions caused by global temperatures getting warmer. Only half of the worrisome increase in atmospheric CO2, is then the consequence of human fossil fuel burning and other activities. So yes, it has been getting warmer, this is not a thumb-on-the-scales effect, but this warming accounts for nearly half the Keeling curve increase in atmospheric CO2. This warming also precedes the big post WW-II ramp-up in industrial CO2, suggesting that it is natural warming driving a natural CO2 emission and not the incipient warming driving soil CO2 emissions in an atmospheric CO2/temperature runaway. The reason I favor a terrestrial source, specifically soils, for the temperature-driven CO2 emission is that partition in carbon exchange between land in ocean is known through the atmospheric oxygen assay. Were there a temperature-driven increase in CO2 emissions from the oceans, that would need to be balanced by an increased sensitivity of the oceans to atmospheric CO2 concentration, and I don’t have that coefficient to “play with” because the Revelle mechanism is well-known reaction rate chemistry. On the other hand, the sensitivity of plant growth to CO2 concentration is one of the big “known unknowns” that I have chosen to adjust to match the Keeling curve in light of a temperature sensitivity of soil CO2 emissions. Yes, if soil emissions have that level temperature sensitivity, you should see a lot more than the seeming rock-steady CO2 levels in pre-20th century ice cores. I am told that the ice core data is controvertible because once the gas bubbles are compressed into voids in the ice, they simply do not, they cannot move. But if soil emissions increase with temperature the way Bond-Lamberty and Thomson say they do, and there is proxy evidence of century-scale variation of atmospheric temperature, I am inclined to mutter eppur si muove on those gas bubbles. To summarize my TDLR (to long — didn’t read) post above, were soils to increase their rate of CO2 emission with increased temperature, this would not supply a mechanism for a runaway greenhouse. If soil emission increased with temperature, plants must have a corresponding higher uptake of CO2 with increased atmospheric concentration. If you didn’t have this balancing effect, you would have already seen much more atmospheric CO2 increase than the 290 to 400 ppm increase. And if plants absorb that much CO2 with increased atmospheric concentration 1) humans are only partially responsible for the increased level of atmospheric CO2, 2) yes, it has indeed been warming, otherwise you would not have seen CO2 increase to where it is today, 3) the feedback from plant absorption is strong enough to prevent “thermal runaway” of CO2 today and going forward, 4) the time constant for CO2 residence in the atmosphere is more on the 20-year scale than the 50 years Ferdinand Englebeen is insisting on let alone the multi-hundred years that IPCC and the Bern Curve is claiming. Thanks for all those details, Paul. It is much appreciated. Something that I’ve wondered about in the correlation of paleo temperature with paleo CO2 concentrations was what was driving what, i.e. was CO2 driving temperature or was temperature driving CO2? With numerous claims about the temperature records leading CO2, the latter makes more sense and you are describing the likely mechanism for that. That actually makes sense, and I did read all of it. My bold: Are they saying what I think they are saying? If we increase the range, we are likely to be within the real range? Whoda thunk. “By increasing our real understanding, we might even end up making our climate projections more uncertain, in terms of a greater range in the extent the planet might warm,” he said. “But we’ll be more confident that the true answer falls within that range.” (Note the weasel-word “might” in the quote above and ask yourself what the speaker is actually pinning himself down to). Sure. I’m 100% confident that climate sensitivity for a doubling of CO2 falls between -100C and 1000C. And that uncertainty is somehow better than a 95% confidence that climate sensitivity is somewhere between 0.1C and 15C? Why? Of what independent relevance does a confidence that a “true answer” falls within a “range” have, that is unrelated to the boundaries of the range? Even setting aside that issue, the “true answer” to”the extend the planet” warms in response to CO2 is a single solution, involving a single climate system of a single unique planet. “Confidence” in the solution has no real meaning in such a circumstance. You either get the “true answer” right – and prove its right – or you admit that you don’t know it. There’s nothing in between. If no one has ever demonstrated the ability to get that answer right at all, you can’t know for certain any meaningful and precise boundaries around where that answer lies. Bio-char is another way of fixing carbon in elemental form in the soil, and also has other benefits in encouraging plant growth. Advancing our confidence and taking necessary actions will ultimately require that we embrace uncertainty as a fact of life. We’ve gone from “the science is settled” to “by increasing our real understanding, we might even end up making our climate projections more uncertain…” Someone is misleading the public, and it’s becoming more and more obvious that it is “the science is settled” crowd that is engaging in deception. 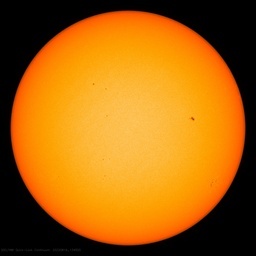 Any honest scientist would admit that we still have a lot to learn about the climate. What I question in the press release for this paper is the need for “taking necessary actions” when there is so much admitted uncertainty surrounding climate projections. How can you possibly know what actions are “necessary” if you are uncertain about the outcome? We don’t even know yet if a little warming is going to be a net positive or a net negative overall. There is already evidence that the greening of the planet due to more CO2 is a good thing. Until we learn otherwise, it is foolish to spent a fortune trying to stop what might turn out to be a good thing. Environmentalists assume that warming will be harmful because they believe it is human caused. They have a built-in bias against anything caused by humans and automatically assume it has to be harmful to the planet. Why not wait until we actually know that harm is occurring before we take expensive, and possibly fruitless, steps to prevent it? They are saying we should fix CAGW even if we are uncertain there is CAGW. I had seen another research group give a presentation on this kind of rotational grazing. Seriously, this is the future. An excellent video, sir! Agro-managment should be about getting maximum productivity for one’s investment. This strategy produces more and healthier cattle for less investment in feed, fertilizer, or medicine. Polyculture of forage improves the soil, which in turn improves yield of forage – a true positive feedback. Stockmen have known since ancient times that herds should be moved from one pasture to another before they can severely deplete/destroy it. The real innovation here is in the ‘cocktail’ of seeds that maximizes the health of the soil and the stock. ‘Carbon sequestering’ is not the prime or even the secondary objective, but it is useful in terms of appeasing those annoying whiners from the cities who have their own ‘priorities’ and think they know enough to tell real farmers and ranchers how to run their businesses. If people on this website did not use the word ‘carbon’ in the sloppy, deceptive way that Warmists use it. There is very little actual ‘CARBON’ in the atmosphere…and not a lot of CARBON DIOXIDE in the soil. Language matters when dealing with people who are attempting to deceive. There is active organic chemistry in agricultural soils (as opposed to say desert sand, with less). Some factor limits the accumulation of organic products, otherwise organic C in soils would keep on increasing. Not much progress will be made until that limiting factor is characterised in detail. There might be two, three, even 50 limiting factors. It is a dynamic system with slow and fast cycles, so modelling will be complicated. Many soils analysed for organic carbon in the traditional manner show relatively predictable levels of a couple of % carbon. The limiting factors, whatever they are, usually hold it around that level. IMO, these limiting factor(s) will generally involve inputs other than CO2 and related. Increase could be limited by nitrogen chemistry, or by sulphur chemistry, or by water cycles, or by biological entities. Again IMO, this is a research matter that will be slow to unravel if people approach it with preconceptions such as that CO2 has to be involved. Start with an open book and an open mind. The answer is not beyond the wit of investigation skills and tools now available. Thank you for this very informative summary. Soil respiration 59 GT Carbon to the atmosphere annually, isotopically fractionated to -21 PDB. Humans 9 GT Carbon to the atmosphere annually, isotopically fractionated to -24 PDB. For whatever reason, the planet warms. Which do you expect to respond more to the warming and how will we know the difference? Climate science is so incredibly wrong about feedback it’s absurd and the errors (more than 1) go back 3 decades to Hansen and Schlesinger. Whenever I hear ‘Its the feedback’, it reminds me of the line from movie Idiocracy, “It’s the electrolytes”. One of the errors is how feedback is modeled, where it uses a Bode feedback system to ‘predict’ the change in temperature, dT, resulting from a change in forcing, dR. Bode’s analysis simply doesn’t apply to any system where the input and output are not linearly related to each other (this assumption is stated in the first sentence of the second paragraph of his book). If R is the input and T is the output, linearity means that R/T = dR/dT and anone thinks that this applies to the relationship between power density and temperature apparently hasn’t heard of the Stefan-Boltzmann LAW. The only proper way to apply Bode is to make the output of the feedback system the equivalent BB emissions of the output temperature and not the temperature itself (these are interchangeable), apply the model once for the reference and again for the new conditions and then subtract the R’s and T’s from each other to determine dR/dT. But when you do this, the nominal feedback is limited to 0.38 positive (assuming Schlesinger’s unit open loop gain did) limiting the sensitivity to about 0.3C per W/m^2, rather than the 0.5-0.8 positive feedback required to support the insane sensitivity claimed by the IPCC. Of course, the IPCC will reject a proper analysis that gets an answer that refutes their reason to exist in favor of an improper analysis that gets the answer then need to justify their very existence. It’s called confirmation bias. If you’ve been to NOAA’s website lately, they’ve stopped using land use in their calculations for co2 totals. I think that missing co2 has become an issue. From a long running argument a few years ago, I saw a farmer injecting co2 into the soil in Indiana. The number that stuck with me about the amount of co2 in the soil wasn’t double, but about 10 times. Of course the warmist and farmers had never heard of such a thing. They probably aren’t doing that now as co2 has been identified as a pollutant. It’s one of those times you wish you had taken a picture.